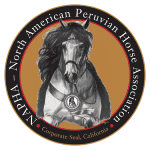 The North American Peruvian Horse Association (NAPHA) Annual High Point Awards are given to the highest performing Peruvian Trail Horse, Parade Horse, and Open Show Horse. The horse must be registered with NAPHA and owned by an Associate or Governing Member in good standing in the NAPHA to be eligible for these awards. The Annual High Point Awards are not part of the Joy of Riding Program but are administered by the Joy of Riding Committee. Enrollment in the Joy of Riding Program is not required for participation. Download, print, and complete the appropriate PDF form (links given below). Then mail the form to the NAPHA Office. You must have Adobe’ Reader installed to view and print the form. The JOR Committee has determined the NAPHA High Point Horses (Rules, section 24-6) for the year 2009. The JOR Committee has determined the NAPHA High Point Horses (Rules, section 24-6) for the year 2008. The JOR Committee has determined the NAPHA High Point Horses (Rules, section 24-6) for the year 2007. The JOR Committee has determined the NAPHA High Point Horses (Rules, section 24-6) for the year 2006. Congratulations to all the horses and owners who applied for the awards.